"I think 40% better when I sit like this." "I think 40% better when I sit like this." The above info came from Mimi, and was edited by yours truly (contact me). The images came from photobucket and photobucket. 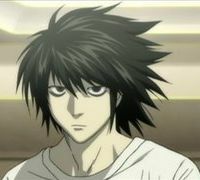 L is a private detective, the world's top detective. He never shows his face to anyone. When he makes his debuts it's with a computer screen that reads L and a mechanical voice. When he finally does reveal himself to only a chosen few, no one was prepared for what they saw. He's young, loves sweets and hates to wear shoes. He's very serious and hates to lose. 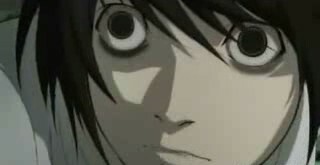 When he starts the Kira case, he immediately begins the investigation with Light. 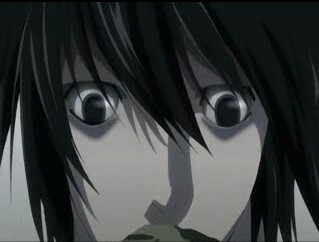 As Light tries to prove his innocence, L gets more proof that Kira is, in fact, Light. 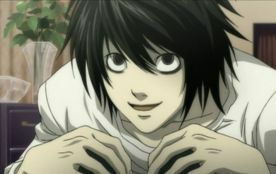 He even invites Light the join the Kira investigation in order to gain more evidence against him, but unfortunately Light is always three steps ahead. 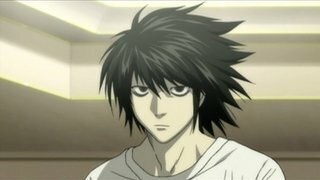 L's full name, L Lawliet, is finally revealed in "How to Read 13", which is considered to be the 13th volume of the Death Note manga series. He was born on October 31, 1979, enters the series on December 4, 2003 at the age of 24, and dies on November 5th of the following year at age 25. 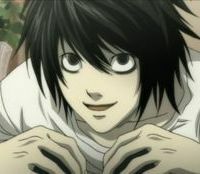 However, the anime adjusts the years a bit, making L's birth occurring in 1982. The above description came from Mimi, and was edited by yours truly (contact me).